Oil prices caused one-third of the job cuts that U.S.-based companies announced in the first quarter, according to a new report. March was the fourth month in a row to record a year-over-year increase in job cuts, Chicago-based outplacement consultancy Challenger, Gray & Christmas Inc. reports. And 47,610 of the 140,214 job cuts announced between January and March were directly attributed to falling oil prices. Not surprisingly, the energy sector accounted for 37,811 of the job cuts — up a staggering 3,900 percent from the same quarter a year earlier, when 940 energy jobs were cut. However, U.S. energy firms only announced 1,279 job cuts in March, down about 92 percent from the 16,339 announced in February and down nearly 94 percent from the 20,193 announced in January. The trend held true in Houston, where several energy employers announced job cuts in January and February, while fewer cuts were announced in March. Overall job-cut announcements are declining, as well. U.S. employers announced 36,594 job cuts in March, down 27.6 percent from the 50,579 announced in February and down 31 percent from the 53,041 announced in January. In December, 32,640 job cuts were announced. “Without these oil related cuts, we could have been looking one of lowest quarters for job-cutting since the mid-90s when three-month tallies totaled fewer than 100,000. However, the drop in the price of oil has taken a significant toll on oil field services, energy providers, pipelines, and related manufacturing this year,” John Challenger, CEO of Challenger, Gray & Christmas, said in a statement. SAN FRANCISCO (MarketWatch) — U.S. oil production is on track to reach an annual all-time high by September of this year, according to Rystad Energy. If production does indeed top out, then supply levels may soon hit a peak as well. That, in turn, could lead to shrinking supplies. The oil-and-gas consulting-services firm estimates an average 2015 output of 9.65 million barrels a day will be reached in five months — topping the previous peak annual reading of 9.64 million barrels a day in 1970. Coincidentally, the nation’s crude inventories stand at a record 471.4 million barrels, based on data from U.S. Energy Information Administration, also going back to the 1970s. The staggering pace of production from shale drilling and hydraulic fracturing have been blamed for the 46% drop in crude prices CLK5, -1.08% last year. But reaching so-called peak production may translate into a return to higher oil prices as supplies begin to thin. Rystad Energy’s estimate includes crude oil and lease condensate (liquid hydrocarbons that enter the crude-oil stream after production), and assumes an average price of $55 for West Texas Intermediate crude oil. May WTI crude settled at $49.14 a barrel on Friday. 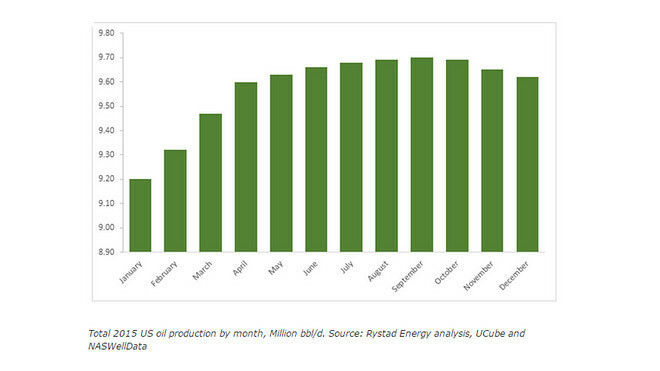 The forecast peak production level in September is also dependent on horizontal oil rig counts for Bakken, Eagle Ford and Permian shale plays stabilizing at 400 rigs, notes Per Magnus Nysveen, senior partner and head of analysis at Rystad. Of course, in this case, hitting peak production isn’t assured. “Some will be debating whether the U.S. has reached its peak production for the current boom, without addressing the question of what level will U.S. production climb to in any future booms,” said Charles Perry, head of energy consultant Perry Management. “So one might also say U.S. peak production is a moving target.” James Williams, an energy economist at WTRG Economics, said that by his calculations, peak production may have already happened or may occur this month, since the market has seen a decline in North Dakota production, with Texas expected to follow. The number of rigs exploring for oil and natural gas in the Permian Basin decreased five this week to 285, according to the weekly rotary rig count released Thursday by Houston-based oilfield services company Baker Hughes. The North American rig count was released a day early this week because of the Good Friday holiday, according to the Baker Hughes website. District 8 — which includes Midland and Ector counties — shed four rigs, bringing the total to 180. The district’s rig count is down 42.68 percent on the year. The Permian Basin is down 46.23 percent. At this time last year, the Permian Basin had 524 rigs. Texas’ count fell six this week, leaving 456 rigs statewide. In other major Texas basins, there were 137 rigs in the Eagle Ford, unchanged; 29 in the Haynesville, down three; 23 in the Granite Wash, down one; and six in the Barnett, unchanged. Texas had 877 rigs a year ago this week. The number of rigs in the U.S. decreased 20 this week, bringing the nationwide total to 1,028. There were 802 oil rigs, down 11; 222 natural gas rigs, down 11; and four rigs listed as miscellaneous, up two. 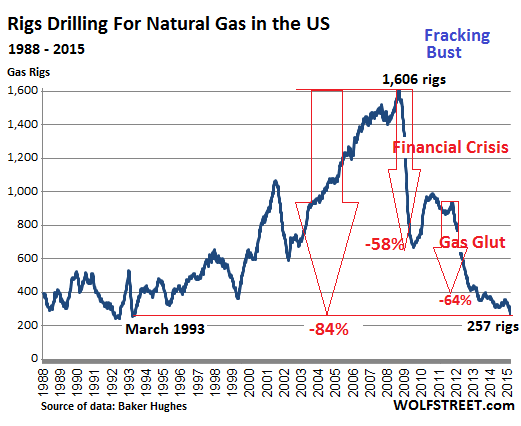 By trajectory, there were 136 vertical rigs, down eight; 799 horizontal rigs, down 13; and 93 directional rigs, up one. The last time the horizontal rig count fell below 800 was the week ending June 4, 2010, when Baker Hughes reported 798 rigs. There were 993 rigs on land, down 17; four in inland waters, unchanged; and 31 offshore, down three. There were 29 rigs in the Gulf of Mexico, down four. The U.S. had 1,818 rigs at this time last year. The top five states by rig count this week were Texas; Oklahoma with 129, down four; North Dakota with 90, down six; Louisiana with 67, down five; and New Mexico with 51, unchanged. The top five rig counts by basin were the Permian; the Eagle Ford; the Williston with 91, down six; the Marcellus with 70, unchanged; and the Cana Woodford and Mississippian with 40 each. The Mississippian idled three rigs, while the Cana Woodford was unchanged. The Cana Woodford shale play is located in central Oklahoma. The number of rigs operating in Canada fell 20 this week to 100. There were 20 oil rigs, up two; 80 natural gas rigs, down 22; and zero rigs listed as miscellaneous, unchanged. The last time Canada’s rig count dipped below 100 was the week ending May 29, 2009, when 90 rigs were reported. Canada had 235 rigs at this time last year. The total number of rigs in the North America region fell 40 this week to 1,128. North America had 2,083 rigs a year ago this week. This entry was posted in Amerca, Economy, Oil, Oil Bust, OPEC and tagged jobs, Midland Texas, oil prices, Permian Basin, Unemployment on April 4, 2015 by Bone Fish. 43% of adults would prefer homes bigger than where they currently live, but attitudes differ by age. Baby boomers would prefer to upsize rather than downsize by only a small margin, while the gap among millennials is much wider, with GenXers falling in between. Would-be downsizers outnumber upsizers only among households living in the largest homes. Last year, we found that Baby Boomers were especially unlikely to live in multi-unit housing. At the same time, we noted that the share of seniors living in multi-unit housing rather than single-family homes has been shrinking for decades. These findings got us thinking about how the generations vary in house-size preference. So we surveyed over 2000 people at the end of last year to figure out if boomers have different house-size preferences than their younger counterparts. And that led us to ask: What size homes do Americans really want? As a whole, Americans are living in a world of mismatch – only 40% of our respondents said they are living in the size home that’s ideal. Furthermore, over 43% answered that the size of their ideal residence is somewhat or much larger than their current digs. Only 16% told us that their ideal residence is smaller than their existing home. However, these overall figures mask what is going on within different generations. It’s natural to think that baby boomers are the generation most likely to downsize. After all, their nests are emptying and they may move when they retire. As it turns out though, more boomers would prefer to live in a larger home than a smaller one: 21% said their ideal residence is smaller than their current home, while 26% wanted a larger home – a 5-percentage-point difference. Clearly, boomers don’t feel a massive yearn to downsize. On the contrary, just over half (53%) said they’re already living in their ideally sized home. Nonetheless, members of this generation are more likely to want to downsize than millennials and GenXers. In fact, those younger generations want some elbow room. First, the millennials. They’re looking to move on up by a big margin: just over 60% told us their ideal residence is larger than where they live now – the largest proportion among the generations in our sample. By contrast, only a little over 13% of millennials said they’d rather have a smaller home than their existing one – which is also the smallest among the generations in our sample. The results are clear: millennials are much more likely to want to upsize than downsize. The next generation up the ladder, the GenXers, are hitting their peak earning years and many in this group may be in a position to trade up. Many aren’t living in their ideally sized home. Just 38% said where they live now is dream sized. Nearly a majority (48%) said their dream home is larger, while only 14% of GenXers would rather have a smaller home. This is the generation that bore the brunt of the foreclosure crisis. 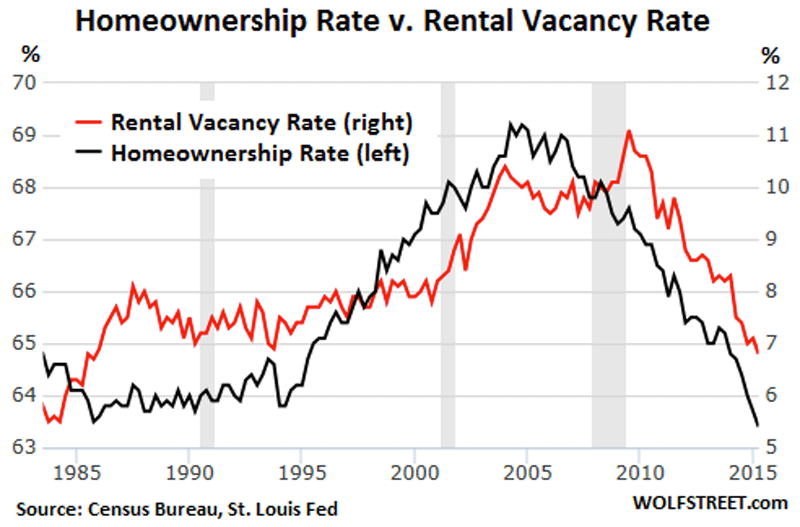 So, some of this mismatch could be because a significant number of GenXers lost homes during the housing bust and may now be living in smaller-than-desired quarters. But a much more probable reason is that many GenXers are in their peak child-rearing years. With kids bouncing off the walls, the place may be feeling a tad crowded. 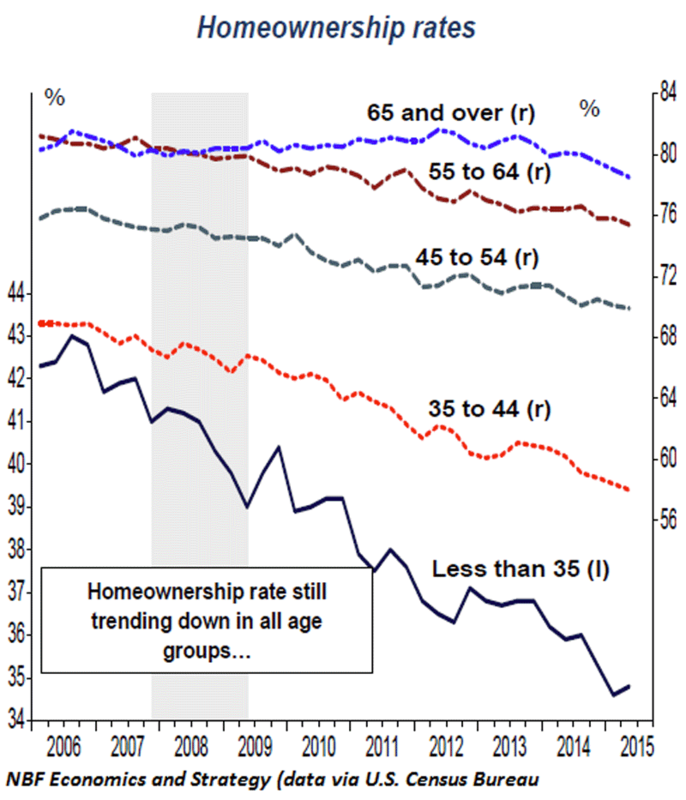 Of course, age doesn’t tell the whole story about why people might want to downsize. It could be that certain kinds of households, – such as those without children, and living in the suburbs or in affordable areas – might be more likely to live in larger homes than they need. But our survey shows that households in these categories are about twice as likely to want a larger than a smaller home. For those with kids especially, the desire to upsize is strong: 39% preferred a larger home versus 18% who liked a smaller home. For those living in the suburbs, the disparity is even greater – 42% to 16%. And even among those living in the most affordable zip codes, where ideally-sized homes might be within the budgets of households, 40% of our respondents preferred larger homes versus 20% who said smaller. Are all households more likely to upsize than downsize? At this point you might be asking, “Are there any types of households that want to downsize?” The answer is yes. But only one kind of household falls into this category – those living in homes larger than 3,200 square feet. Of this group, 26% wanted to downsize versus 25% that wanted to upsize – a slight difference. But, when we looked overall at survey responses based on the size of current residence, households wanting a larger home kicked up as current home size went down. We can see this clearly when we divide households into six groups based on the size of the home they’re living in now. Among households living in 2,600-3,200 square foot homes, 37% prefer a larger home versus 16% a smaller home; in 2,000–2,600 square foot homes, its 34% to 18%; 38% to 18% in 1,400–2,000 square foot homes; 55% to 13% in 800–1,400 square foot homes; and 66% to 13% in homes less than 800 square feet. This makes intuitive sense. Those living in the biggest homes are most likely to have gotten a home larger than their ideal size. 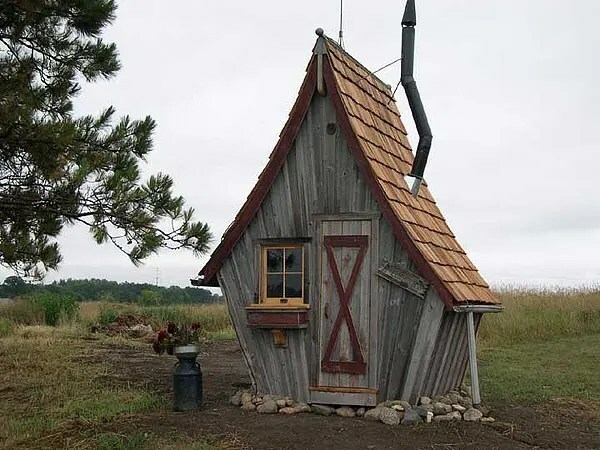 And those in the smallest homes are probably the ones feeling most squeezed. The responses to our survey show significantly more demand for larger homes than for smaller ones. But the reality, of course, is that households must make tradeoffs between things like accessibility, amenities, and affordability when choosing what size homes to get. The “ideal” sized home for most Americans may be larger than where they’re living now. But that spacious dream home may not be practical. As result, the mismatch between what Americans say they want and what best suits their circumstances may persist. 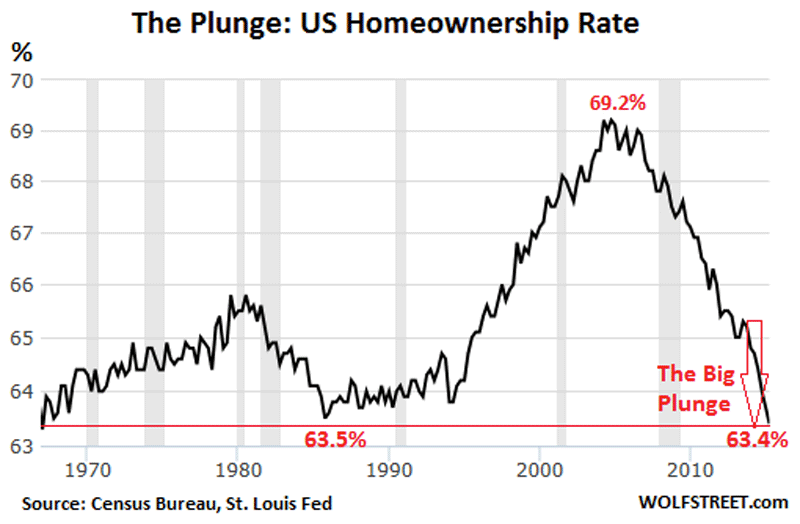 This entry was posted in Economy, Housing, Housing Market, Luxury Homes, Luxury Housing, Marketing, Real Estate, Uncategorized and tagged America, Baby boomers, California, California Assn. 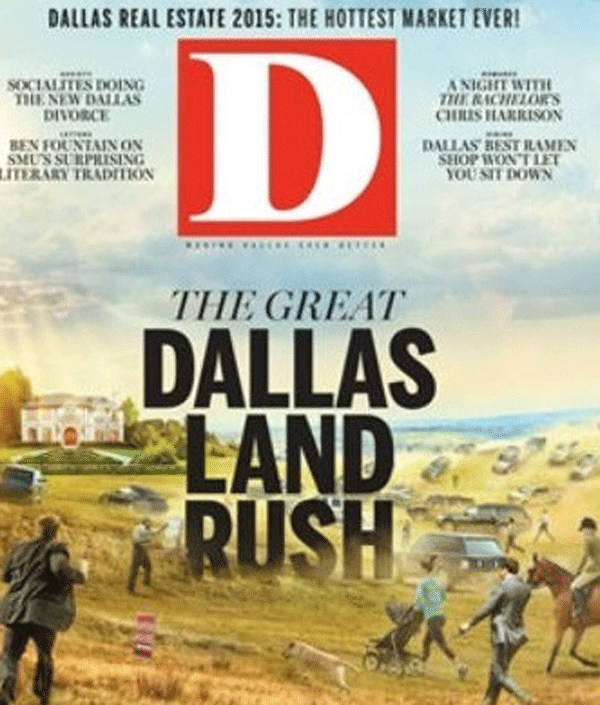 of Realtors, households, housing market, Midland Texas, Mortgage Bankers Association, National Association of Realtors, Trulia on March 6, 2015 by Bone Fish.